MINNEAPOLIS–(BUSINESS WIRE)–Elavon, a global payments provider and subsidiary of U.S. Bancorp, has acquired CenPOS, a Miami-based company offering integrated payment software solutions to large enterprises. Elavon provides end-to-end payment processing solutions and services to more than 1.3 million customers in the United States, Europe, Canada, Mexico, and Puerto Rico. As the leading provider for airlines and a top five provider in hospitality, healthcare, retail, and public sector/education, Elavon’s innovative payment solutions are designed to solve pain points for businesses from small to enterprise-sized. U.S. Bancorp, with 74,000 employees and $465 billion in assets as of September 30, 2018, is the parent company of U.S. Bank, the fifth-largest commercial bank in the United States. The Minneapolis-based bank blends its relationship teams, branches and ATM network with mobile and online tools that allow customers to bank how, when and where they prefer. U.S. Bank is committed to serving its millions of retail, business, wealth management, payment, commercial and corporate, and investment services customers across the country and around the world as a trusted financial partner, a commitment recognized by the Ethisphere Institute, which named the bank a 2018 World’s Most Ethical Company. Visit U.S. Bank at usbank.com or follow on social media to stay up to date with company news. Bobcat, Caterpillar, and other companies that offer rental equipment, all are impacted by new credit card processing rules for rentals. While businesses expect their software, including ERP, Point of Sale, and ecommerce shopping carts to help them manage compliance with credit card acceptance rules, the reality is that many don’t. Compliance increases profits; non-compliance increases new chargeback risks, interchange fees, penalty fees and authorization declines. Traditional desktop terminals don’t support the new transaction data requirements. If merchant is not using EMV chip device, now is the time to upgrade to a cloud-based solution and fix two problems at once. 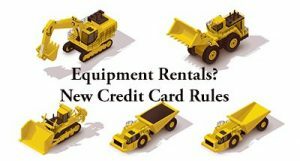 Rental merchants cannot meet both card acceptance and Payment Card Industry Data Security Standards compliance requirements using traditional paper credit card authorization forms. Cloud technology and a compliant payment gateway are needed. For example, pair the Verifone MX 915 with the CenPOS validated Point to Point Encryption (P2PE) solution and use either a standalone or integrated to ERP such as Microsoft Dynamics AX. Initial authorization transaction must send new transaction indicator that it’s an estimate; the final amount could change for example because the renter kept it longer or damaged the equipment. This is technically managed by the payment gateway. If applicable, send incremental authorizations with related indicator. If storing the card, the Visa Stored Credential mandate outlines the specific requirements for agreement with customer, cardholder authentication, and procedures to use a stored card on file. For example, perform cardholder authentication with either security code or 3-D Secure. 3-D Secure can only be invoked if the customer self-pays; it shifts friendly fraud liability to the issuer and merchants can also qualify some cards for even lower interchange rates. Update language in agreements for opt-in to terms and conditions as required by Visa. Card issuers and acquirers were mandated to be compliant in 2017, and merchants by October 2017, however, there’s no mandate for payment gateways. Even if an existing payment gateway supports the new requirements, merchants must make changes. Visa is the most complex, however other brands have similar rules. From tokenization to Express Checkout, CenPOS creates a seamless commerce experience throughout the enterprise. Innovations, including Express Checkout via text or email, help businesses maximize profit in all departments. CenPOS takes the heavy lifting out of payment acceptance offering a range of solutions that simplify every aspect of implementing, operating and maintaining a payment system enabling merchants to focus on their business. CenPOS Express Checkout via text or email includes 3-D Secure capability as part of a layered security approach. CenPOS is an integrated commerce technology platform driving innovative, omnichannel solutions tailored to meet a merchant’s market needs. Providing a single point of integration, the CenPOS platform combines payment, commerce and value-added functionality enabling merchants to transform their commerce experience, eliminate the need to manage complex integrations, reduce the burden of accepting payments and create deeper customer relationships. Powered by its enterprise-class, end-to-end transaction engine, CenPOS’ secure, cloud-based solutions seamlessly integrate with a merchants existing infrastructure minimizing disruption and saving time and money. Committed to a merchant-centric approach CenPOS provides a one-to-one level of service and support, enabling merchants to focus on their core business. Headquartered in Miami, Florida, CenPOS is reshaping the future of commerce through technology innovation and the secure, flexible and simple solutions this enables. Christine Speedy, CenPOS Global Sales, 954-942-0483. Miami, FL April 23, 2018. The business-to-business (B2B) e-commerce sales channel presents new opportunities and challenges, particularly with increasingly complex credit card processing requirements. 3dcart, a leading e-commerce platform, has partnered with CenPOS, an integrated technology commerce platform. The CenPOS ‘Super Payment Gateway’ maximizes profits while mitigating the higher dollar value transaction risk in the B2B vertical. “With the CenPOS integration, we expand the payment solutions offered by 3dcart to provide existing and prospective customers globally an additional alternative to how they process credit cards today, with any acquirer they choose,” stated Gonzalo Gil, 3dcart CEO. The 3dcart CenPOS integration currently supports credit card, EFT/echeck with and without guarantee, Paypal and alternative payment methods. CenPOS POS and mobile and are available standalone now and will be integrated in the future to provide 3-D Cart customers a validated point to point encryption (P2PE) option. A validated P2PE solution significantly reduces merchant scope for PCI Compliance. CenPOS also includes to all 3dcart customers their electronic bill presentment and payment (EBPP) solution, supporting wire payments, text messaging, and other key B2B items of interest. CenPOS (https://www.CenPOS.com is a merchant-centric, end-to-end payments engine that drives enterprise-classsolutions for businesses, saving them time and money, while enabling merchants to create deeper lasting relationships with their customers. CenPOS’ secure, cloud-based solution optimizes acceptance for all payment types across multiple channels without disrupting the merchant’s banking relationships. PCI Level 1 Service provider, QIR Certified, P2PE Validated, HIPAA compliant. https://www.cenpos.com/ CenPOS 877-630-7960, Christine Speedy direct 954-942-0483. Looking for a Validated P2PE Solution? CenPOS launched their PCI-Validated P2P Encryption 3.2 solution in 2017. Florida-Based Payment Solutions Company, CenPOS, Strives to Make Customer Experience More Secure with Launch of PCI-Validated P2P Encryption. Data breaches are on the rise and they are costing both consumers and merchants money. When the consumer data that makes such fraudulent activity possible comes from the merchant’s database, then the merchant can also incur some major damages. In fact, the 2017 Cost of Data Breach Study: United States, found that the total average organizational cost of a data breach has reached a new high at $7.35 million. CenPOS aims to reduce the vulnerability of sensitive consumer data — that could be used to drain debit card-linked bank accounts, make “clone” credit cards, or buy items on certain less-secure online sites — to hackers with the release of its Validated P2PE solution. Officially released on July 7th of this year, CenPOS Validated P2PE encrypts cardholder data so businesses can simplify compliance with Payment Card Industry Data Security Standards (PCI DSS) and consumers can stop worrying about data being stolen between “the store” and the bank. Surprisingly, Validated P2PE is not new technology. It’s the strongest level of data encryption in the market right now and is offered by other merchant payment services companies. However, CenPOS is the first and only company with the Qualified Integrator & Reseller (QIR) designation to offer a Validated P2PE solution. The QIR designation is awarded by the Payment Card Industry Security Standards Council, a global open body formed to develop, enhance, disseminate and assist with the understanding of security standards for payment account security. According to their standards, “the quality, reliability, and consistency of a QIR Company’s work” should provide confidence that the merchant’s payment application has been implemented in a manner that supports PCI DSS compliance. Christine Speedy, CenPOS Sales 954-942-0483, 9-5 ET is based out of South Florida and NY, selling globally. When you call Christine, there is no middle man; all agreements are direct with CenPOS. As one of the very first to sell for CenPOS, I have deep experience to help merchants understand benefits and get live fast. See also this article for important certifications. I’m advising my CenPOS clients with card not present transactions to use either the hosted pay page or Electronic Bill Presentment and Payment (EBPP), also known as electronic invoice presentment and payment (EIPP) due to increasingly complex rules. Plus cardholders are weary about giving out card data over the phone, and paper or digital credit card authorization forms should be abolished. Reducing friction to collect payments, while putting cardholders in control of their data, is proven to increase sales, profits and cashflow so updating procedures is a win win for you and your customers. What is a hosted pay page? A hosted pay enables customers to passively pay bills online via a secure web page hosted on a CenPOS server. The form can be embedded on your web site secured with an SSL certificate or you can direct customers to your custom CenPOS URL. The most common payment types CenPOS users enable are credit cards, Paypal, and ACH (echeck). The burden for completing data fields to make a payment is on your customer. Your customer can optionally create an account and store their card data. Depending on your agreement with your customer, either you or the customer can use a stored token on file to initiate future transactions. With EBPP, the payment request is delivered to the customer via email or text. The message includes a custom link to pay a specific bill or invoice and some of the fields are pre-filled. Customers prefer EBPP vs hosted pay page. The most common payment types CenPOS users enable are credit cards, Paypal, ACH (echeck) and wire transfer. The last is very important for international businesses to streamline bank reconciliation and match deposits to invoices. Data fields, including invoice number and amount, are pre-filled to save your customer time. Customers can optionally create an account to store card data, pay multiple invoices, review payment and invoice history in the CenPOS hosted portal. With a CenPOS ERP or accounting software integration, your records are automatically updated with payments, and reminders are automatically delivered. Optional 2-way texting service has many benefits, including communicating with customers via their preferred methods- whether phone, text or email. What are the benefits of customer initiated payments with hosted pay page or EBPP? Increased efficiency to comply with new stored credential rules. Mitigate chargeback risk – with cardholder authentication fraud liability shifts to issuer. In summary, either method of online payments increases security and enables customers to pay 24/7 to increase cash flow. EBPP solutions have significant additional benefits and the cost to implement is virtually nil, with many businesses experiencing an instant ROI.